Before jumping into the topic of fertilizing bonsai, I’ll share a tip. Bonsai can roughly be lumped into two categories – trees in development and trees in refinement. Trees in development may or may not look like bonsai yet. There’s a lot to say about these stages, but for now I’ll make a single distinction. For trees in development, vigorous growth is desired. This produces trunk girth and branch complexity fast. For trees in refinement, less vigorous growth is desired. We want greater numbers of smaller branches. Now, on to the main topic. There are two basic categories of fertilizer – organic and inorganic. Each can take one of two basic forms – liquid and solid. Fertilizers contain some number of macro and/or micro nutrients – compounds that help plants grow. If you’re new to the topic, you can find a near bottomless supply of good primers online. You may find a lot of noise (vehement or contradictory advice), however, when you search for information relating to fertilizing bonsai. Feel free to read it as it piques your interest. Feel just as free to ignore it. For all the talk about different fertilizers, I have not seen a lot of data from controlled studies comparing feeding approaches for ornamental applications – let alone applications for small container-grown trees of great age and character. That said, bonsai professionals can make great recommendations based on their experience growing trees where they’ve lived and worked. I tend to follow it, see how it works for my trees, and learn what I can from it. For trees in development, feed throughout the growing season. For trees in refinement, start feeding after spring growth has hardened off (matured) through the end of the growing season. That’s it. Feel free to select a fertilizer regimen of your choosing. If you stick to it for a full season, you’ll have a great data point from which you can continue your learning the following year. As with the other topics in this series, here are a few tips and things to consider related to fertilizing. The single most effective strategy for fertilizing bonsai: create a schedule and put it on the calendar. A consistent approach to feeding trees is the best way to guarantee success. Some fertilizers are much stronger than others. If you’re worried about “fertilizer burn” (overfeeding your trees), start with half the amount recommended on the label. Think creatively: if a label recommends applying liquid fertilizer every two weeks, feel free to dilute the fertilizer 50% and feed every week. Feeding more frequently can be useful if you use liquid fertilizers and find that much of what you apply runs past the roots and quickly exits the pot through the drainage holes. When you use solid fertilizers on the surface of the soil, your bonsai will get nutrients every time you water. If you have several trees that are the same age and variety, try experimenting with different approaches to fertilizing. The more you experience you have using organic and inorganic fertilizers, liquid fertilizers and dry, the better equipped you’ll be when you want to try fertilizer-intensive techniques like decandling. Sick bonsai or bonsai with insect infestations typically need less fertilizer than healthy bonsai. Popular organic fertilizers for bonsai include fish emulsion, cottonseed meal, and kelp or seaweed-based fertilizers. 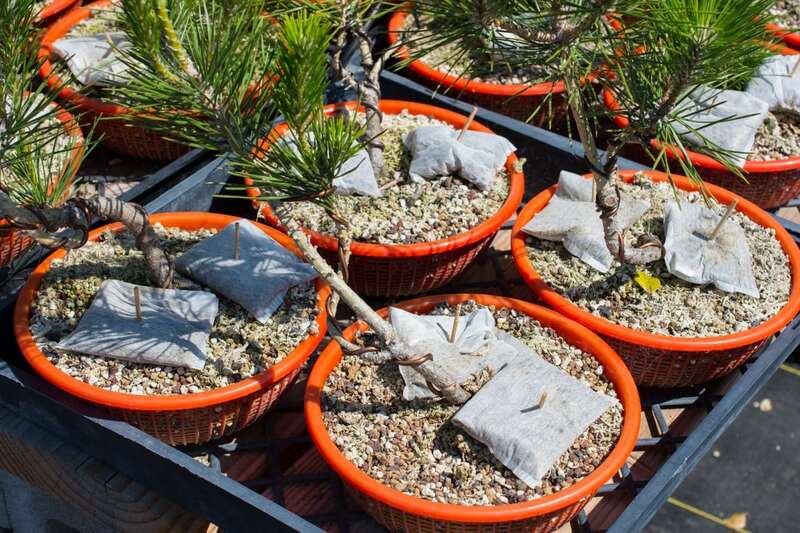 Popular inorganic fertilizers for bonsai include Miracle-Gro and Miracid. Imported fertilizers and fertilizers made specifically for bonsai can be effective but tend to cost more. Popular brands include BioGold and Tosho Omakase. Can I use a hose siphon to deliver liquid fertilizer when I water? Yes, though do note that this approach works best when the fertilizer needs of all of your trees are the same. I applied dry fertilizer to the surface of the soil and it disappeared overnight – what happened? Rats, mice, squirrels, raccoons, possum or birds may take an interest in your fertilizer or the grubs living inside it. If your fertilizer keeps disappearing, try another kind of fertilizer or switch to liquid fertilizer. Can I use time-release fertilizer on my bonsai? Yes. Time-release fertilizer (also known as slow-release or controlled-release fertilizer) works by releasing nutrients over time, simplifying the act of fertilizing. This simplicity comes at the expense of control as brands like Osmocote release more nutrients in warmer weather (read more here). What is foliar feeding – and does it actually work? Foliar feeding refers to the application of liquid fertilizer directly to the leaves of a plant. It’s been shown to be effective (read more here) and is not uncommon among bonsai enthusiasts. Feel free to give it a try. Thanks for making it this far – we’re 30% done! Next up: How to tell when something’s wrong with your bonsai.